Open Letter To Bostrom And NASA's Richard Terrile: Evolution Wrong, Fossils Planted? The idea that we are inside a simulation is true anyway (if we define “simulation” as being described as emergent from a computational substrate). Nick Bostrom, director of Oxford University’s 'Future of Humanity Institute', and others became famous with such more than 2000 years old ideas warmed up in fashionably modern lingo, see Simulation Hypothesis on Wikipedia. 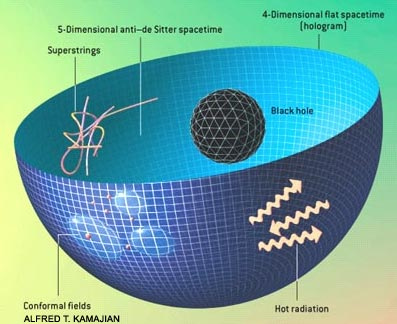 The holographic universe: A “simulation” anyway! Richard J. Terrile appeared on “Through the Wormhole”, a Science Channel show, where Richard discussed that our experience is something like advanced “The Sims”. Self-defined skeptics such as on Science Blogs usually bash Intelligent Design creationists for every tiny comment on planted fossils. Yet because Bostrom and people like Degrasse Tyson belong to the scientism in-crowd, "our team", they are left untouched. But make no mistake: The idea is not that evolution made us and thereby computers and in turn thereby our world as a simulation. The idea is that there is fundamentally no difference between simulation and evolved world, so that the world is perfectly well described as created by the simulator, which makes evolution just a story that perhaps is there to hide the creator. You defend the simulation hypothesis. There are criticisms that I as a physicist could make. For example, quantum mechanics (QM) neither proves pixilation nor a finite universe, and reducing QM to “You see what you need to see” misses the core of that physics, for example apparent non-locality (which is atypical in today's video game experience!). As a philosopher, I could come down harshly on the opinion that speed of calculation proves anything about the possibility of self-conscious algorithms. However, in an interview situation, profound scientific issues easily become confused and perhaps editing also distorted your opinion. I therefore read as charitable as possible, which leaves only questions and no criticism – so please do not take the following as criticism, but as a question that you owe an answer to [and Nick Bostrom or perhaps even Ray Kurzweil (who has slightly similar ideas but does not as far as I know fall into the simulation-now hypothesis category) may like to answer this question as it applies to them, too]. You put forward “You see exactly what you need to see” as a support of the simulation hypothesis, because video games are programmed precisely like that. Evolution theory explains this differently, namely by selected efficiency of the perceiving system (not of the simulating system ! ): perception and brain calculation is resource intensive, thus natural selection ensures that they are optimized. You propose that the simulator (creator) deceives us for pure efficiency of calculation (although that is unnecessary with ever more speedy calculations). Please do not answer about the 'sciency' nature of the creator in order to distract from the core question, because the issue here is not the simulation hypothesis, but strictly whether you support creationism in its rejection of the fossil record as simulated while other 'sciency' people demand that creationists may not even be teachers. This is a simple yes or no question. *For example, one could propose that if the creator does not simulate evolution, the simulation cannot be his self-creation, because it is not indistinguishible from not-simulated evolution.